Now that you have mastered the box step there are a few things we are going to do to play with that today. The first is going to be starting your box on the other foot. Men will step forward with your Left foot and move to the right on the side step to begin and Ladies will step back on their Right foot and move to the Left. Continue your box with the men stepping backwards on the Right and to the Left to complete the box and the Ladies stepping forward on the Left and to the Right to complete. Now that you can start the box step on either foot, we are going to give you a reason to do so. 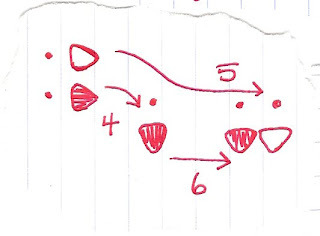 Going back to the first box step you learned (Men starting forward on your Right foot and Ladies back on your Left) we are going to turn each 3 steps a quarter turn. 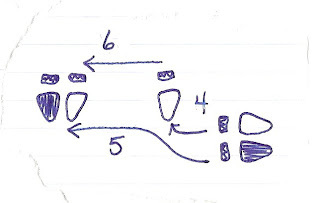 This will allow you to do a full turn and end up back where you started after 2 full sets (R-2-3, L-2-3, R-2-3, L-2-3) or half a turn after what would have been one box previously. Any turn to the Right is called a Natural Turn. 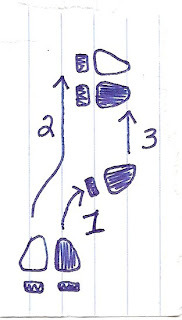 Though nothing has changed from the original box step in terms of which foot you are placing where, the quarter turn requires a little explanation. Before you even move your feet, begin to slightly turn your shoulders to the Right (your Left shoulder should be coming forward and your Right slightly back). This is the indication for your partner that you are about to turn and it makes the following steps easier. 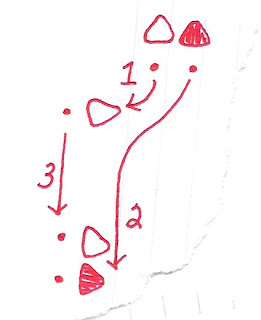 Starting now, as you did, with your Right foot going forward curve the forward step forward and around to the side to face the wall to your right. Complete the bar of music by stepping side with your Left foot and closing together with your Right. Now you are facing a new direction and are about to step backwards on your Left foot. Keep your shoulders turning to the Right and your foot will naturally curve as you step back and slightly side onto your Left foot, side onto your Right and close together on your Left. At this point you should be facing directly opposite from where you started. Continue moving forward with your Right foot again, with the curve as demostrated and complete two more sets of 3 to find yourself back where you started. The footwork is the same as for the Box Step you have already learnt but with a slight curve on the backwards or forwards steps. As you begin, you should feel your partner's shoulders rotate slightly to the Right. (As you are facing backwards, this will mean that your Right shoulder will feel like it is moving backwards as your Left comes slightly forward to catch up.) This is your cue to begin turning and allow that turn to influence your next step. You will still step back on your Left foot, but now, because your shoulders are turning, you need to make the step turn with you - so the step takes a slightly arched path to move back. You then complete the bar with your regular side step on your Right foot and close them together with your Left. Now facing the wall that was to your Right you can start the second part of your box. Keeping your shoulders turning slightly, take your forward step with your Right foot on the same arc that you took the backwards one - moving forward but slightly side. This allows you to complete another quarter turn and finish the bar of music with the step side on your Left foot and close your feet together with the Left. You should now be facing the wall that was at your back when you started. 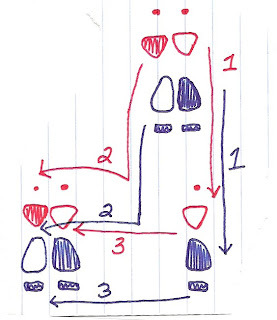 Taking your backward step on your Left again, continue to turn a quarter on each bar of music (count of 1-2-3) for 2 more bars (on the second bar, you will be stepping back again) and then you should be back where you started. - Remember that any forward or backward step now curves slightly. This does not mean that it should curve so much that you do not move on it... allow your turn to take the space it needs (remember the side steps will travel as well) and then finish it back where you started. Just because the end result is the same as the beginning position does not mean that you have to stay there the whole time. 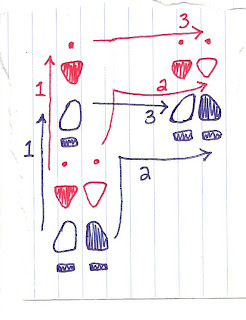 - This quarter turn can be applied in exactly the same way to the Box Step starting with the Left foot. Your lead (the movement of your shoulders and body) will initiate to the Left now and your turn will move in the opposite direction. When turning to the left, you are said to be doing a Reverse Turn. Some people find turning this way to be more difficult than to the Right so be sure to get comfortable in going both ways.